Women entrepreneurs and business owners face a number of challenges, not the least of which is time management. Yet, for many professional women, the upside of spending some of their very valuable time on philanthropic endeavors cannot be overstated. Charities surely need the skills that professional women offer, but volunteers also benefit both personally and professionally from the experience. Volunteering with charitable organizations provides women the gratification of giving back and the connection to their larger community while simultaneously enabling them to gain worthwhile leadership skills and enhance their professional development. In addition to the obvious personal rewards of volunteering, some of the professional skills that can be honed by working with nonprofit organizations and community boards are organizational management, public speaking, event planning, marketing material development, written communication, troubleshooting, and alliance building. Charitable organizations offer great training for professional women, helping them gain confidence in their capabilities while also exposing them to people working in local nonprofits and businesses that they might otherwise never meet. So everyone wins — the organization receiving the volunteer support, the volunteer’s business, and the volunteer herself. Ideally, women should align their volunteer efforts with causes about which they are truly passionate. 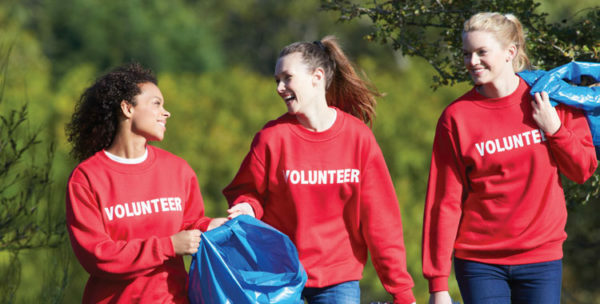 When a volunteer is fully committed to the mission of a nonprofit organization, her efforts are more heartfelt, effective, and ultimately impactful. Initially, volunteers can match their existing professional skills with the needs of their chosen charity. Certified Financial PlannerTM professionals, for example, can oversee the fiscal workings of a nonprofit; women who work in public relations or marketing can help with the charity’s promotional materials; and those in management can help with board oversight. Once a volunteer develops a new skill, she should make every effort to utilize it in her own business setting. If public speaking is a talent developed when volunteering, for example, find opportunities to demonstrate that new proficiency in your workplace or with a professional association. To reinforce the ability, offer to make a formal presentation for clients or to be a speaker at a professional conference. Pushing yourself to use the skill developed while volunteering will make it more likely that it becomes part of your permanent professional repertoire. Another benefit of volunteer work for women is that they are given the chance to learn from and collaborate with professional mentors. By expanding one’s network through volunteer work, you can build relationships with people outside of your usual professional sphere, gaining new insights along the way. Who knows — a fellow volunteer or mentor may even think of you when an exciting new business opportunity arises. Of course, juggling professional life, family life, and philanthropic work can be challenging at times, particularly for women with younger families. And sometimes women just starting out in the business world believe they must postpone giving back to their community. But there are many ways to pitch in. Young professionals may not be able to attend every volunteer meeting, but they can write communications materials at night from their home computer or make phone calls on behalf of their charity. For professional women, it can be easy to live in a bit of a bubble. By volunteering with charitable organizations, working women gain insights into the life experiences of those receiving assistance as well as a greater understanding of their larger community. The friendships formed and experiences shared with those being served, with nonprofit staff members, and with other volunteers are uplifting and life-affirming. And the professional skills learned are invaluable. Marilee Falco is a principal and financial strategist at JoycePayne Partners of Bethlehem, Pa., and Richmond, Va., responsible for client financial strategy and counsel, comprehensive financial planning, and investment management. A CERTIFIED FINANCIAL PLANNER™ professional and chartered financial consultant, she can be reached at mfalco@joycepaynepartners.com.